Spencers Solicitors are proud to be an accredited member of the Association of Personal Injury Lawyers (APIL), an organisation which has been fighting for the rights of injured people for over 25 years. APIL hold an annual Injury Prevention Day with a view to raising awareness on ways to prevent injury and harm. This year’s focus is on avoiding needless injuries by ensuring vehicle head restraints are properly adjusted. According to APIL, the UK has 50 percent more traffic on the roads than the European average and this congestion, coupled with bad driving habits, can create a recipe for low-speed collisions and injuries. Ultimately, head restraints that are properly positioned could help to prevent subsequent neck and back injuries, hence the focus on this very issue as part of APIL’s Injury Prevention Day for 2018. When someone is involved in a road traffic collision, their neck is thrown forwards and then backwards, causing it to stretch and strain, resulting in neck and back pain. It is this mechanism that is known as whiplash. Studies show that most whiplash injuries are caused by rear impact. 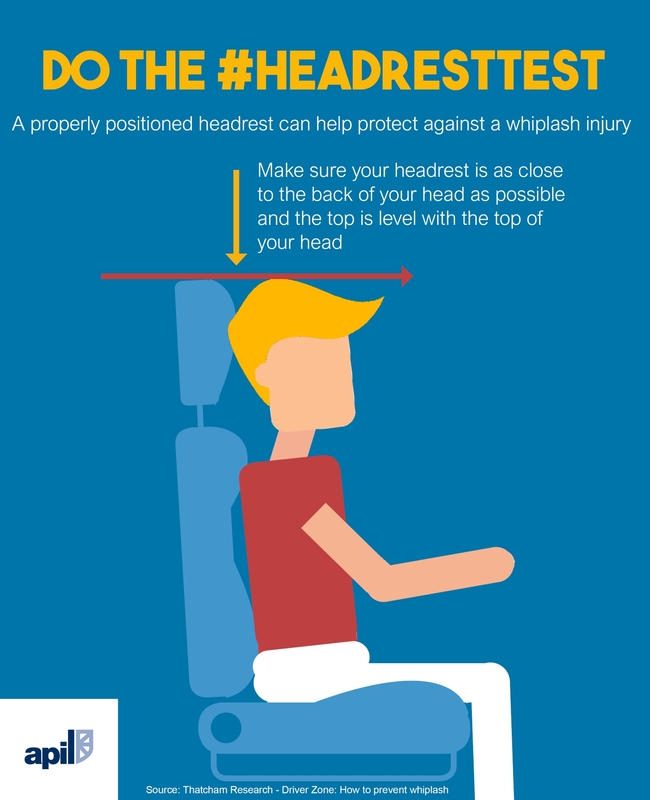 A vehicle fitted with a well-adjusted and designed head restraint can limit the movement of the neck and support the head for a longer period in an accident and could protect against prolonged injury. The Royal Society for the Prevention of Accidents (ROSPA) have provided a useful fact sheet and help guide on head restraints and has provided the following illustration of the correct position of a head restraint. Position the head restraint close to the rear of your head as possible. ROSPA has also provided useful advice when buying a car, be it brand new or second hand. Always check the head restraint position before purchasing a car, to ensure it can be adjusted into the correct position for you. Make sure that the head restraint is lockable which will avoid it slipping down when the vehicle is in motion and stop passengers adjusting it when climbing into the back of the car. If the head restraint in the correct position is not comfortable, try adjusting your seat. Euro NCAP carry out several tests on new vehicles, including testing seats and head restraints to prevent injury after accidents. Visit www.euroncap.com to view safety ratings. Spencers Solicitors have over 40 years’ experience in dealing with personal injury claims and having seen first-hand the pain and suffering which can be caused by a whiplash injury, the team here are fully supportive of APIL’s Injury Prevention Day and this year’s all important focus on head restraints. Remember ALWAYS make sure that you check the headrest before travelling in ANY vehicle to make sure it is in the correct position. Amy Smitheringale is a Solicitor with more than 20 years experience in civil litigation. Amy currently manages the Complex Injury Team which deals with serious and major injuries, including traumatic brain injury, spinal injury, fatal claims and clinical negligence.